Cheese & Grain. Courtesy of Bruges Tozer Architects. 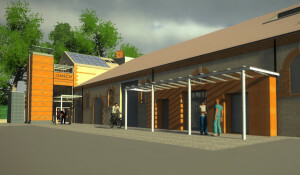 Exciting plans for a £500,000 regeneration of the Cheese and Grain have been revealed. The proposal would see a derelict part of the building transformed into rehearsal, training, and recording studios, creating a centre for music, live performance, creativity and cutting edge technology. Cheese and Grain director Steve Macarthur said, “This development will create jobs, it will provide a resource to multiple local businesses, and it will help local musicians, producers, agents, and promoters. “It’s an ambitious project; perhaps even audacious. We probably have two or three years’ hard work ahead of us. And that’s if everything, at every stage, goes well. “Working with our partners at Bath Spa University and Young People Frome it will become somewhere that local people can train and gain qualifications. It will be a key resource for the Cheese and Grain’s new apprenticeship scheme. “The proposal is to turn the two floors above into a rehearsal, training and recording studio. It will also be used for filming and sound and image engineering. For example, a band could rehearse and record – emerging with CDs ready for sale and a filmed performance ready to upload to You Tube or other visual media. 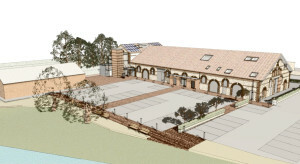 “The project is expected to cost £500,000 plus the cost of external works and VAT. We are in detailed conversation with a couple of Trusts and with Lottery officials about raising this money. The plan lists a possible eight new rooms over two floors including a reception, office, control room, three multi-purpose spaces, and a ‘live room’. The Cheese and Grain is a nationally renowned venue and sees approximately 180,000 visitors per year flock to a range of concerts, productions, conventions, and festivals. It is hoped the regeneration will improve the venue’s capacity as a productive work space. The development has been designed by Beckington-based sustainable architects Bruges Tozer. Their report said, “The project will restore a much loved and unique building that would be at risk if it isn’t found a new productive role. The building, when restored, will have a significant economic role in the town providing training and workspace. “Some partners are still to be identified, but with a potential 400 sq m space over three floors and the use of the already developed first floor at the front of the building there is plenty of scope. All pictures with kind permission of Bruges Tozer Architects.